Use this filter to generate stylized titles that glow, burn and disappear over time. At default settings it is designed to be applied to titles or other moderately sized alpha objects. When applied to large alpha objects or non-alpha video it can produce overly blown out levels by default. This can be moderated by disabling the glow group to permit adding erosion to just the edges of the these larger objects. The primary use of this filter is with text and other alpha objects. Burn Width: Controls the width of the edge erosion. Larger values tend to erode farther into the alpha boundaries. Conform Alpha: Controls how the eroded alpha channel is modified by the original input alpha. When enabled, this prevents the alpha regions from growing or “leaking” beyond the original sources alpha boundaries. When Texture Amounts are high (which they are by default), this control should remain on to avoid spurious texture elements from appearing in regions away from the alpha object. With lower Texture Amount settings this control allows edges to grows outside their original hard boundaries to produce looser, more organic looking shapes. 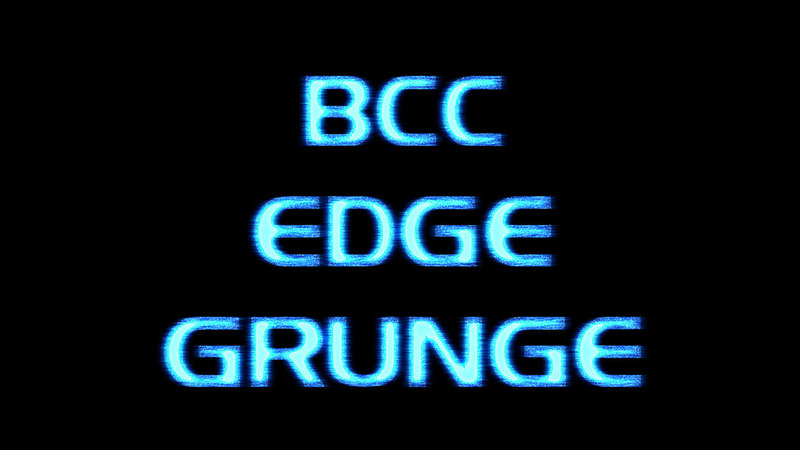 Disappearing Edge: When Conform Alpha is enabled, this option determines whether or not the original alpha shape is allowed to erode versus maintaining the original alpha channel with only the RGB pixels modified by the grunge portion of the effect. Fade Width: Controls the rate of opacity fading near the edges of the burn pattern. Larger Fade Widths soften the burn pattern edges which can produce smoother results when animating the Burn Progression. Color 1: Specifies the color band closest to the outer edge of the burn pattern (i.e. farthest from the interior of the alpha object). Color 2: Specifies the color band second from the outer edge of the burn pattern (i.e. second farthest from the interior of the alpha object). Color 3: Specifies the color band third from the outer edge of the burn pattern (i.e. second closest to the interior of the alpha object). Color 4: Specifies the color band fourth from the outer edge of the burn pattern (i.e. closest to the interior of the alpha object). Color Blend: Specifies how smoothly one color band blends with the next. Burn Progression: Specifies how far the burnt edge progresses toward or away from the layer edge. A maximum burn progress of 100 will erode the alpha object until it is completely gone. Texture Amount: Specifies the amplitude of the texture to be added to the erosion pattern. Larger Texture Amounts spread the grunge erosion across more of the alpha object. Texture Grain Size: Specifies the size of the grain texture. Burn Intensity: Specifies the strength and intensity of the generated burn colors as they replace the original image colors. Layer Border Options: Controls how regions outside the image edge are treated when computing the erosion shape. Opaque: All regions outside the image are assumed to be fully opaque. Add Original: Specifies the extent to which the original image colors are added to the generated burns colors when the Burn Intensity is less then full. Low values leave just the generated burn pattern present even if the burn intensity is low. Controls the properties of the glow applied to eroded text. Avoid Clipping checkbox: This feature enables the glow to expand beyond the edges of the filtered image. This generates an even glow past the edges of the image. Enabling the feature clips the glow with a soft falloff toward the edge of the filtered image. Glow: Displays just the generated glow prior to being applied back to the input clip via the apply modes. Glow Color: Use to set the color of the glow. Default is white. Glow Radius: Use to set the radius over which the glow spreads to surrounding regions. X Width: Independent control for the width of the glow. Y Width: Independent control for the height of the glow. Matte Layer: If a matte layer is selected, the alpha premultiplied RGB values of this layer are used as a matte, applied to the RGB Glow (before the blur) independently for each channel E.g. if a pixel in the matte layer is pure blue, the corresponding source pixel will only contribute to the blue channel before the glow is applied. Blur Type pop-­up: This two way pop-up lets you use a Box or a Triangle blur for the glow effect. Triangle Blur Iterations: Use to set the number of times the triangle blur is applied to the glow. Higher values will generate a smoother glow but will increase render time. Mirror Edge: Controls the type of edge treatment used in the blurring passes. This function determines whether the image will to repeat or reflect at the edges. Glow From Alpha: The Glow From Alpha option generates the image glow from the alpha channel instead of or in addition to the color channels. The selection in the Glow From Alpha Mode determines how the Alpha Glow and the Color Channel Glows are combined. Glow Alpha Mode: This pop-­‐up is used to select how the alpha glow and the color channel glows are combined. If it is set to Blend (the default) increasing glow from alpha decreases the impact of the RGB channels on the glow. If it is set the Add, the glow from each color channel is added to the alpha glow. Glow Boost Alpha: Controls how much the spread of glow pixels caused by the blur boosts the alpha channel of non-opaque pixels. Glow Under Source: Allows you to animate between compositing the glow over the source (default setting), under the source (setting of 0) or anywhere inbetween. Source Opacity: The opacity of the source image that is composited with the glow. At a setting of zero only the glow is rendered. Apply Mode: This pop-up sets the apply mode that the filter uses to composite the glow over the input image. The default apply mode is “Screen” and there are 27 different apply modes to select from. Apply Mix: Use to blend between a normal apply mode and the user selected apply mode. Mix with Original: Used to blend the filter effect back with the unfiltered input image.